Sweat, tears of joy, epic fails, and Hollywood style success stories — the most interesting elements of every business are always hidden behind the scene. After all, there’s a strong reason why we love to watch movies like Social Network, Silicon Valley or famous artist biographies. There is no doubt that the human factor is what attracts us and helps to understand the brand. That’s why, ladies and gentleman, here comes another season of Human Show! At Performante we will hear the most interesting businessmen, startuppers and inspiring people revealing their secrets about how to build a great business strategy, scale up and get to the top. But also, they will tell us about their moments of weakness and doubts, the hardest decisions, defeats, and lessons learned. 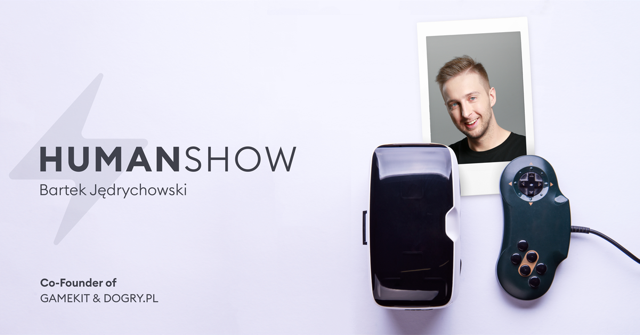 On July 24 we welcome Bartek Jędrychowski and his case study: Founder Perspective. The role of Venture Capital funding. Bartek is a co-Founder of gamekit.com and dogry.pl. Despite his impressive young age, Bartek is working on startups since 2004. He co-founded 3 websites — gryonline.org, sendspace.pl and boja.pl, which has been acquired by strategic partners. Since 2013 Bartek is managing Gamekit, an innovative platform for gamer which allows players to earn gaming gift cards and discounts by playing games and completing different quests. With 15 million registered users Gamekit is the biggest global rewards platform for gamers. We can’t wait to hear his story!